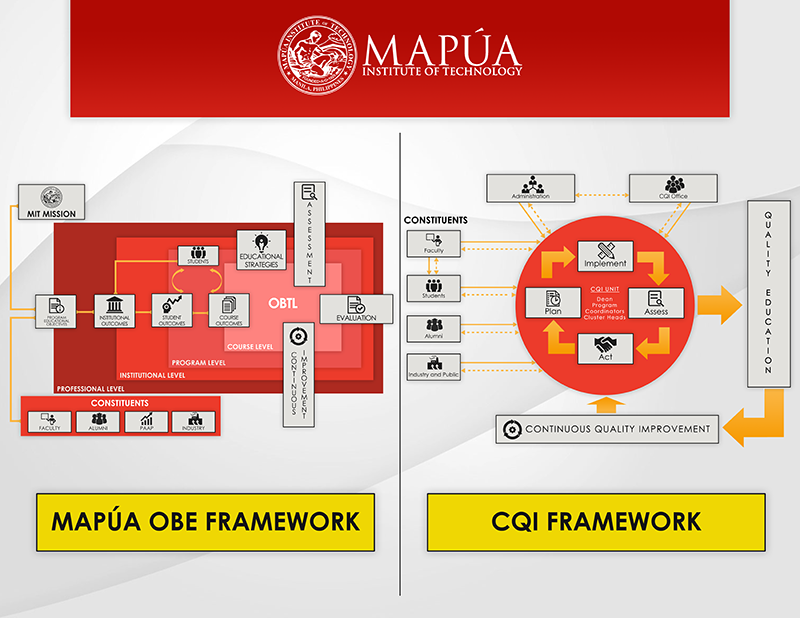 To complement the outcomes-based approach to education adopted by MAPÚA in 2004, the Continuous Quality Improvement Office (CQIO) was created in the same year. The office has the mandate to consistently move the school towards ever higher levels of attainment of the program educational objectives and desired learning outcomes of its various academic programs. In doing so, it ensures that the P-D-C-A approach to continuous quality improvement is strictly being implemented by the schools and academic departments for purposes of academic program improvement and it conducts internal quality audits to check compliance with mandatory, statutory and regulatory requirements as well. CQIO also manages and coordinates all activities relevant to the accreditation of academic programs by both local and foreign accrediting bodies. The Continuous Quality Improvement Office is envisioned to extend its services and expertise on quality, accreditation or certification, and quality management systems beyond the portals of the campuses of the Mapúa University all in aid of quality education in the country. The mission of the Continuous Quality Improvement Office is to oversee, facilitate, coordinate, and ensure the implementation and maintenance of systems and processes that promote continuous improvement for the University and also that realize for its academic programs the attainment of accreditation from local and foreign accrediting bodies. The Continuous Quality Improvement Office (CQIO) is committed to continually implement and maintain systems and processes that satisfy the goals of the University and its academic programs on continuous improvement as well as that fully meet the requirements of local and foreign accrediting bodies.